Download Stock Data from Yahoo. Yahoo incorporated on the second of March 1995 is a web service provider headquartered in Sunnyvale, California and it is owned by Verizon communications. Yahoo was founded by jerry yang and David filo and yahoo was said to be one of the pioneers of the early internet. Of course we all know everything is originated, that is to say everything has a day it began to exist and yahoo is not exceptional. Yahoo at first was not as upgraded as now, however it climbed the ladder of success and became known almost worldwide or maybe even worldwide. Although currently yahoo is said to be dropping as Google is now far more used that yahoo. Due to these activities going on yahoo stocks has been listed for sales. And all Yahoo users can view and equally buy yahoo stocks as if they have the money. 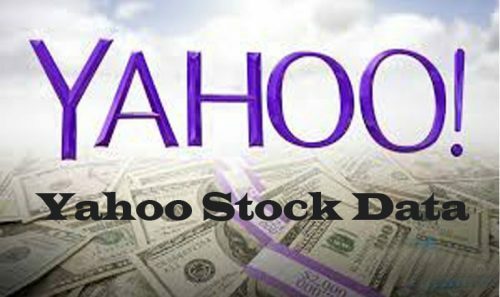 You can easily search and find for any yahoo stocks and buy them at any time you wish. As a matter of fact, most investors currently thinks that now is the best time to invest in Yahoo by buying Yahoo stocks. They believe so much that Yahoo is bound to rise again and is going to be a massive rise. Now if you want to show people the history of a yahoo particular stock, you need to first of all download the stock data from Yahoo. Learning how to download stock data from Yahoo is what this article is all about and if you keep reading, below I will show you how to download stock data from Yahoo. Go to the yahoo finance official webpage via https://finance.yahoo.com/. On the webpage, click on the search bar and enter a quote into the search field, then search. Select the quote you wish to download the stock data and click on it. Click on the historical data link and select the time period, historical prices and frequency then click apply. Now click on the download data link and choose where you want to save the data to.